For the cigar connoisseur who enjoys an excellent variety of hand-rolled premium cigars. The Ashton label offers an exceptional assortment of some of their best-selling tobacco blends in different formats of styles and sizes. Manufactured in the Dominican Republic, Ashton premium cigars are handcrafted from only the finest aged tobaccos. Each cigar listed below in these sampler packs offer diversity of strength and flavor. 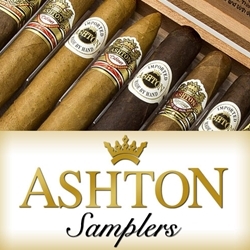 An easy and inexpensive way to try a variety of different styles of the Ashton brand offered here at a great low discount price. These hand-rolled premium cigar assortments make a great gift for a friend or loved one, pick one up today for a low discount price! Call us for more details!